I love to cook, but when it comes to baking I cringe. I can bake brownies, pumpkin breads and gooey cakes just fine, but an actual cake with frosting (even from the box) intimidates me. This past weekend my mother-in-law invited us over for corned beef and cabbage in honor of St. Patrick's Day, and I offered to bring dessert. I asked my friend Nika for suggestions (she's Irish) and she suggested I make a Guinness cake... cringe! Well, on Saturday I finally decided to put my cake baking fear behind me and picked up all the ingredients for a Guinness cake. That afternoon I made my very first bundt cake from scratch and guess what?! I really enjoyed baking it and according to hubby, JD and the Garcia family it was really good! Preheat the oven to 350°F. Butter or spray a bundt pan very, very well. Bring 1 cup Guinness and 1 cup butter to simmer in heavy large saucepan over medium heat. Add cocoa powder and whisk until mixture is smooth. Cool slightly. Whisk flour, sugar, baking soda, and 3/4 teaspoon salt in large bowl to blend. Using electric mixer, beat eggs and sour cream in another large bowl to blend. Add Guinness-chocolate mixture to egg mixture and beat just to combine. Add flour mixture and beat briefly on slow speed. Using rubber spatula, fold batter until completely combined. Pour batter into prepared pan. Bake cake until tester inserted into center comes out clean, about 50 minutes. Transfer cake to rack; cool completely in the pan, then turn cake out onto rack or plate to frost. Directions: To make frosting/drizzle, beat together cream cheese and butter. Add vanilla and slowly mix in powdered sugar. Add milk to desired consistency. Drizzle over cooled bundt cake. Note: I placed my frosting in a sandwich bag, snipped one corner of the bag and drizzled the frosting over the bundt cake. Can you beleive that until recently I had never made flan from scratch (I can just picture my mom frowning as she reads this)?! Well, on a whim I finally decided to try to make one and was excited when I found a very simple recipe on All Recipes. With my trusty assitant chef JD lending a helping hand, I made my very first homemade flan. It was pretty easy to make and I'm guessing I was'nt the only one who enjoyed it; since everyone dug into it before I had a chance to take a pretty slice picture! 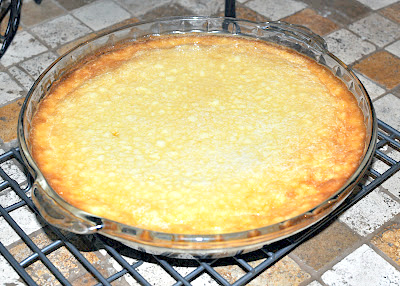 If you love flan you have to try the recipe below, it really is easy to make and yummy too. Enjoy! Preheat oven to 350 degrees F (175 degrees C). In a small, heavy saucepan over medium-low heat, cook sugar, stirring, until golden. Pour into a 10 inch round baking dish, tilting to coat bottom and sides. Set aside. In a large bowl, beat cream cheese until smooth. Beat in eggs, one at a time, until well incorporated. Beat in condensed and evaporated milk and vanilla until smooth. Pour into caramel coated pan. Line a roasting pan with a damp kitchen towel. Place baking dish on towel, inside roasting pan, and place roasting pan on oven rack. Fill roasting pan with boiling water to reach halfway up the sides of the baking dish. Bake in preheated oven 50 to 60 minutes, until center is just set. Cool one hour on wire rack, then chill in refrigerator 8 hours or overnight. To unmold, run a knife around edges of pan and invert on a rimmed serving platter.